IT Operations and Data Centers have to deal with an ever increasing, diverse workload, often resulting in excessive notifications or alerts that then have to be handled. In Halcyon’s constant drive to reduce this ‘alert noise’ and provide exception alerting, an important feature has been added to IBM i (Level 2-4) and Network Server Suite monitoring products. Customers of these Halcyon products can create a rule that monitors a large variety of performance related metrics. As before, if following rule definition, a threshold is breached or other selection criteria is triggered, an alert is generated. However, you now have the opportunity to automatically close the alert if the original condition that triggered the criteria no longer exists. In IBM i Level 2-4 product suites, the auto-close option is included within the rule criteria for Auxiliary Storage Pools, Disk, Jobs, Pools, Subsystems and System-Wide Counters. When using the Change Performance Criteria display, setting the ‘Open alert action’ parameter to *CLOSE means that any open alerts that were generated by this rule are automatically closed if the original criteria that triggered the alert no longer applies. Within Network Server Suite, auto-close of alerts can be applied to CPU, Disk and Memory related rules plus hundreds of different WMI (Windows Management Instrumentation) Counters. Create the rule as normal. 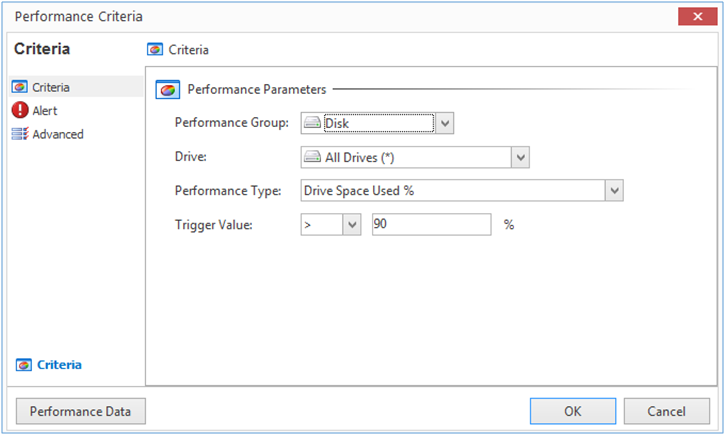 The following example is set to alert should if disk space utilization exceeds 90% on any drive. Define an action that raises an Enterprise Console alert upon the criteria being triggered. From the Criteria navigation panel click Advanced. Within the Alert Intelligence section of this panel, click Auto-Close Enterprise Console alerts so the option is selected and save the rule. By using the Auto-close option you reduce the number of alerts the team need to manage, ensure that the current real-time situation is observed and eliminate time wasted on investigating condition.